I’ve already explained why moving to Georgia isn’t in the cards for Asthma Family, but I might have to add Kansas to the list. Not that Kansas was ever really on the list. Do people even move to Kansas, ever? I’m sure there are many wonderful people and places in that fine state, but I can’t at the moment think of any overwhelming feature that draws relocators. I have not, however, spent any great length of time in Middle America, so for all I know it could be America’s best-kept secret. Kansas, of all places, is kind of pushing the fast-forward button on the debate between coal-fired power and renewable energy. Apparently the state’s secretary of health and environment, Rod Bremby, turned down a permit for Sunflower Electric Power Corp. to build 2 new coal-fired power plants in the western part of his state. Why do I care about this? Better question: why should you? Well, coal-fired power plants are dirty. Worldwatch says the plants produce 40% of this country’s CO2 emissions. And, greenhouse effect and global warming aside, why do I care about that? Because too much CO2 is probably making things worse for allergy and asthma sufferers. And there’s no doubt that the plants also spew all sorts of noxious things, making air pollution even worse, and dirty air most definitely does cause problems for people like Asthma Girl. Of course, the Sunflower Corporation and Kansas legislators worried about reelection are trying to overturn the decision, with the legislators citing job concerns as a natural result of blocking the $3.6 billion project. The debate is getting ugly, too. Can I share with you my favorite part of the article, though? It’s the part about legislators’ thinking that regulation of CO2 will hurt the economy. Can you imagine the conversation between, say, an environmental scientist and one of these idiot lawmakers? Smart Scientist: Um, you know too much CO2 in the air is bad, right? Smart Scientist: Well, we need to control how much gets out there, so things don’t get worse. Idiot: Yeah, we’re not going to do that. Okay, so promoting job growth is part of a legislator’s responsibility to constituents. I get that. Only building facilities that use renewable resources rather than fossil fuels require manpower and thus create jobs, too. Windmills don’t build themselves, do they? I’m going to defer to Worldwatch on this one again. 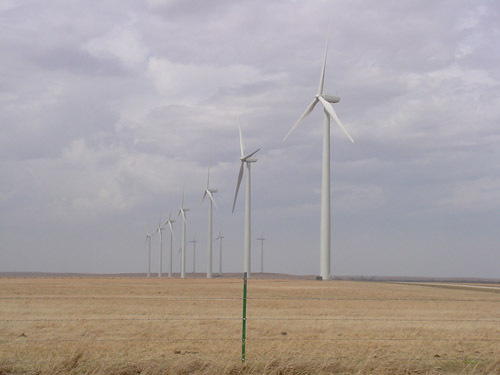 According to a 2006 report, Kansas, North Dakota, and Texas are windy enough to provide energy for the entire U.S. In theory, at least. Also, Worldwatch claims renewable energy creates more jobs than fossil-fuel energy, although I suspect we may not see the full picture until cleaner industry is more widespread. I just can’t figure out why the people in power ignore the obvious. Hello? New renewable technologies will require new businesses and people to staff those businesses. So far we have architects to design the new plants, construction workers and contractors to build them, employees to staff them, and oh yeah–all that CO2 regulation? Requires, I’m guessing, programmers and scientists (at the minimum) to track data. I’m no economist, and even I recognize the logic. North Carolina is getting it right, or at least starting to. Let’s hope Kansas follows.